This durable Listening Center connects with media players to expand classroom learning opportunities. 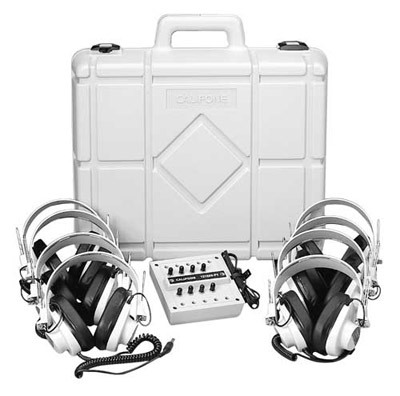 Its rugged and dependable headphones, carry/storage case and jackbox are constructed for individual and group learning applications. • Rugged Polypropylene Carry / Storage case holds entire listening center contents and is impact resistant. • Eight 2924AVP Monaural headphones with fully adjustable, noise reducing earcups made of rugged ABS plastic for added durability. • 8-position 1218AVPY Monaural jackbox with silver-plated contacts eliminate crackling when connecting headphones. Individual volume control for each listening station with 1/4" and mini plugs for versatility. • One year warranty for school use - unlike items purchased from consumer electronics stores whose warranties would be voided if used in schools.